We started on our kitchen plank ceiling and I’m loving the way it looks. I debated for weeks about whether we should do this project or not. We have a really small kitchen and I was worried that a plank ceiling would make the room look too busy (because of the seams) or that it would close the kitchen in, but I think that it’s going to look great. Just a sneak peek at some of our work. I’ll do a post on the completed ceiling as soon as it’s up and painted. See those bare bulbs hanging there? That’s the only light for this room and I wanted to ask your opinion about lighting. More about that at the end of the post. 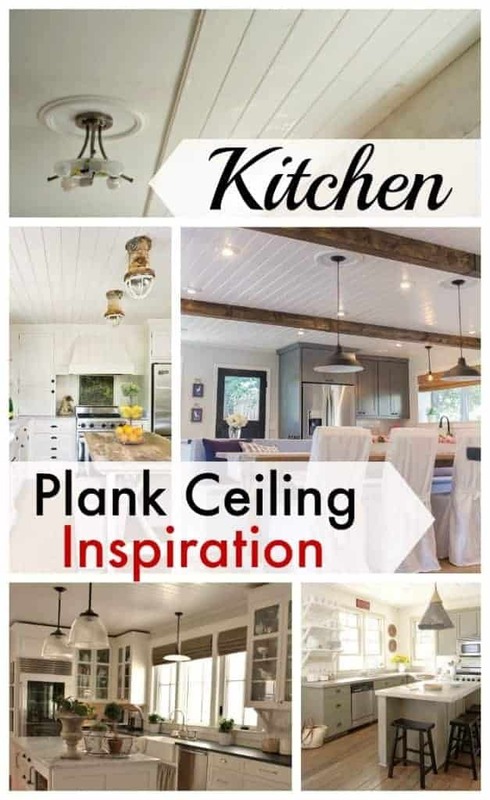 Back to ceilings…I have been looking at pics of kitchen plank ceilings for months in anticipation of this project and I just wanted to share some of my favorites. Love them and they are all great inspiration for our ceiling project! As for lighting in this room, like I said, we have one light in the kitchen, which is in the ceiling in the middle of the room. Once the planks are up we’ll be installing recessed lighting, around 9 lights in all. We have a galley kitchen so we’ll have 4 lights above the cabinets on the refrigerator side and 4 on the sink/window side. The other light will be in the tiny walkway from the kitchen to the dining room. 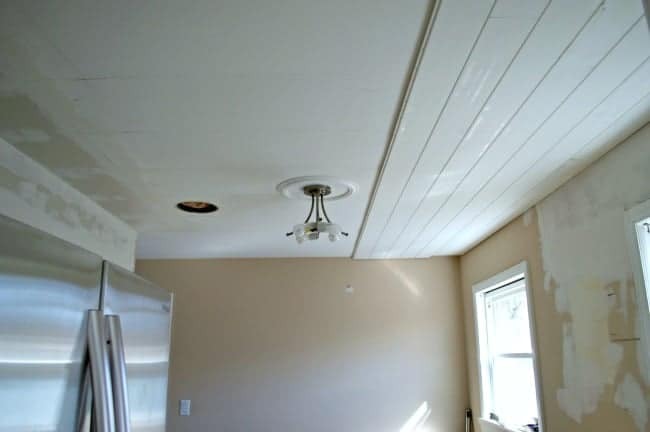 Because we are doing this plank ceiling, I can choose to not have the light in the center and I was wondering what your opinion was. (Just take note that the light that is there won’t come back even if I decide to keep the connection.) Should I loose the center light fixture and only have the recessed lights? Will it be too crowded with the recessed lights if I keep it? 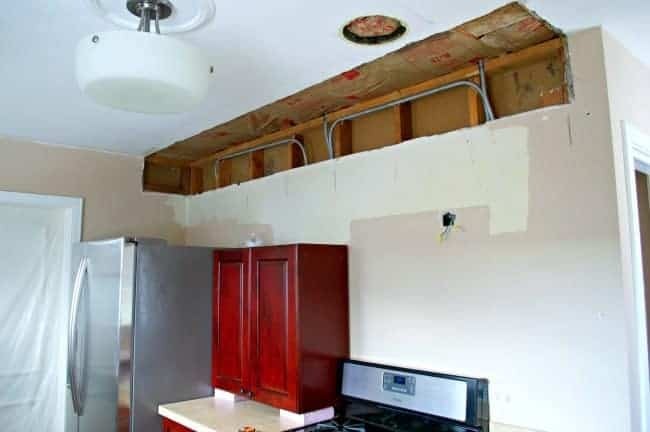 Will I look strange to have only recessed lights if I ditch it? What do you think? 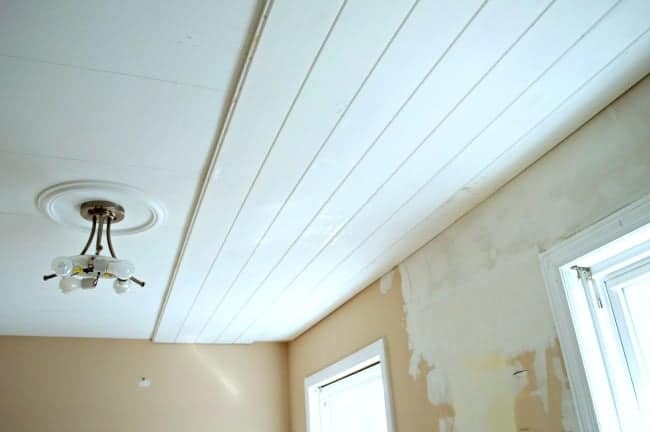 I love, love, love how your planked ceiling is coming along!!! Thanks Kris! I’m so ready for it to be up and painted. Looking great and enjoyed the inspiration pics…Can’t wait to see your beautiful ceiling! 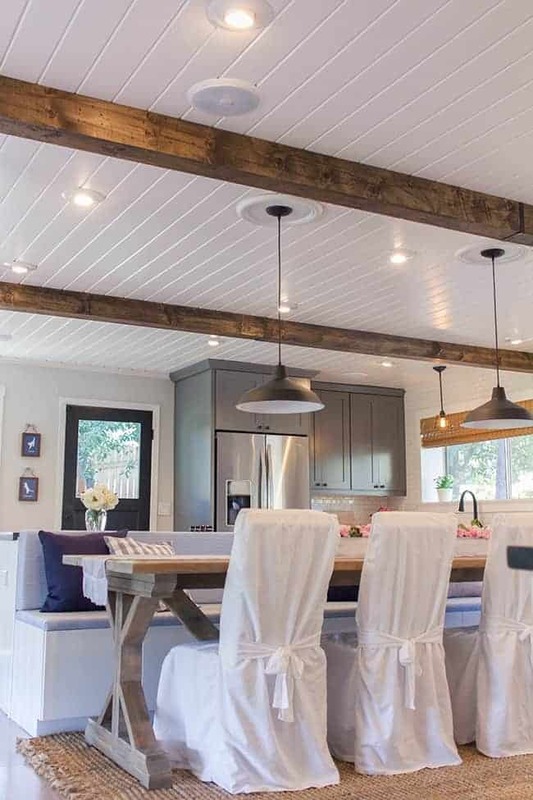 Love the planked ceiling! I think it will add such a fun pop of texture to the room! 🙂 Also: I’m always ALWAYS a fan of more lighting. You can never have too much!! Thanks Giedre. I was thinking the same thing about the light, why get rid of it if it’s already there. You are right about having more lighting…you can never have enough (and it was so dark in there before). Thanks so much for dropping by and weighing in. I truly appreciate it. The plank ceilings will be amazing, since you’ll have so much more ceiling-space with the soffits gone! Also, will draw attention upward, and I’m betting it will be a happy site to see more space up there! I think the recessed lighting would be enough (depending how bright they were!) if there’s some on both sides of the room. And then your ceilings can be uninterrupted, and nothing to drop down to make them seem shorter! You make some great points. I appreciate you stopping in and sharing your opinion. 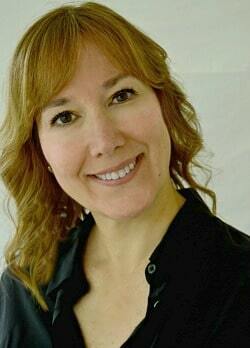 Kristi, just saw one of your projects on “Hometalk” Kudos to you! I love the planking! I didn’t think I would, but it looks great so far. I looked at your photos from when you first started and it looks like the light is over an eat-in area, however in these photos it looks like it is over the galley part of the kitchen. If it is over the eat-in area i would definitely keep it. 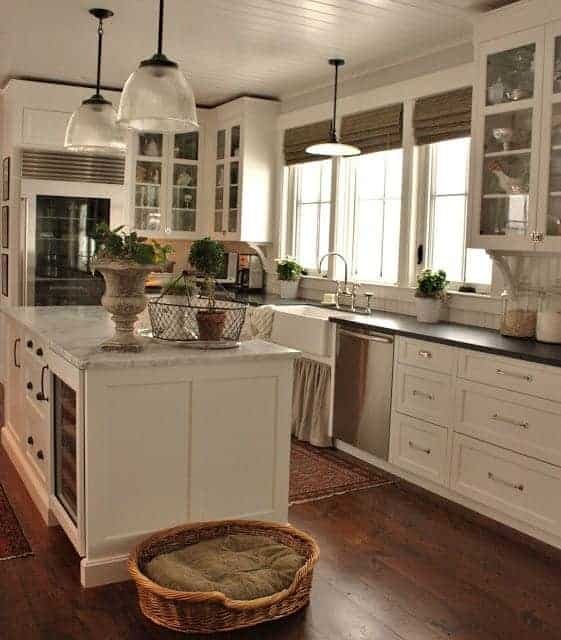 If it’s over the galley part it depends on what type of lighting you will use. Hmm, did you understand any of this, because I’m lost! Whatever you decide I’m sure it will look fantastic! How’s the weather there? It’s getting warmer here and the snow is finally melting. Thanks MJ. You always doubt my brilliant ideas. 😉 (just kidding) I know the pictures are deceiving because the space is small and photographing small is difficult. We have no eat in area in the kitchen. 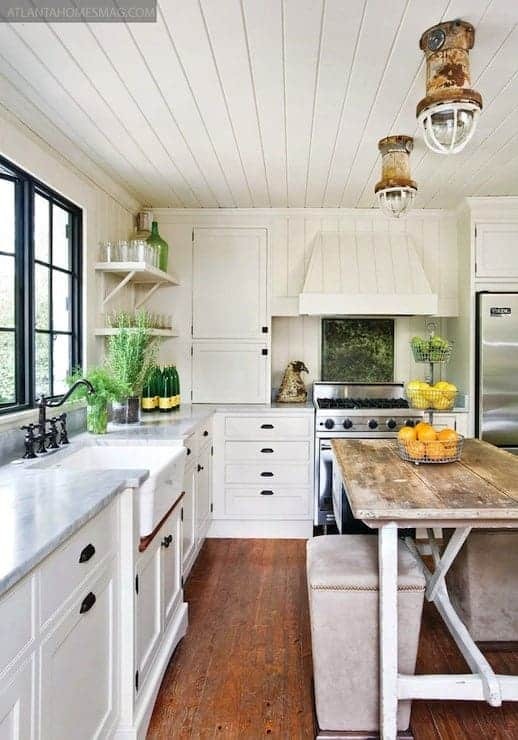 Just the cabinets, stove and fridge in a galley configuration. The light is in the center. Still undecided, which I will probably be until the very last minute. The weather here is great and most of the snow is gone but, sadly, it all changes tomorrow. We will be back in the forties for a while. Glad your weather is improving. Thanks for weighing in and for taking a moment to say hi. I think you made a great choice in planking the ceiling and I would keep the light in the centre of the room. We have sparkly popcorn ceilings and the kitchen ceiling has a bad repair job and several cracks so I plan on planking right over top of it. Are you attaching the wood directly to the drywall? In our last house we put up 1 x 3’s to attach the planks to but then we had already pulled down all the plaster and lath so we needed something to nail into. Thanks Shirlee. I appreciate your opinion. We are attaching the planks directly on the wall. We are using adhesive, screws and staples (the hubs is a bit paranoid). The beams run opposite of the planks so they have something to grab onto. I’ll do a show and tell when I’m done. Thank you, as always, for stopping in today. I think you should leave the light. I don’t think it will look cluttered. One of your inspiration pictures has a hanging light and recessed too. I like your plank ceiling. Thanks Debbie. I appreciate your opinion. I think that if I could find a light that I really loved, my decision would be a little easy. I don’t have much time to decide though. I think that will look great and will probably make the kitchen look bigger because of the seams.